Come to a complete stop until all the children have left the bus. Come to a complete stop until the red lights stop flashing and the stop arm is withdrawn. Change lanes, drive slowly, and pass the bus cautiously. When a school bus is stopped on the road ahead with its lights flashing and its stop arm extended, you must come to a complete stop and wait to proceed until the lights have stopped flashing and the stop arm is withdrawn. You do not need to stop if the school bus is on the opposite side of a divided highway. A good idea if the weather is bad. Appropriate if you don’t know the speed limit. Often a hazard because other drivers may become frustrated and try to pass you. Driving more slowly than other traffic can be dangerous. Drivers behind you may become impatient and will be tempted to take dangerous risks to pass you. Share a lane with a motorcycle. Motorcycles can be easily hidden in a vehicle’s blind spot or missed in a quick look due to their small size. Drivers of cars must always be alert and looking for motorcycles, mopeds, and scooters. Signal and pull into the slow lane. Stop in your lane and put on your hazard lights. Put on your hazard lights and pull off the road. If your vehicle breaks down on a highway, make sure other drivers can see it. Get your vehicle off the road and away from traffic if at all possible and turn on your emergency flashers to show that you are having trouble. Anything that causes evasive action while driving. Anything that takes your attention away from driving. Anything that causes you to pay more attention to driving. A distraction when driving is anything that takes your attention away from driving. Driver distractions may occur anytime and anywhere. Distracted driving can cause collisions, resulting in property damage, injury, and death. The road ahead curves left then right. The road ahead curves right then left. Warning signs are usually yellow with black markings. 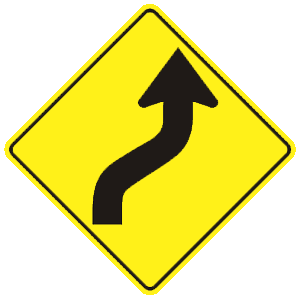 This sign warns drivers that the upcoming road will curve right, followed by a curve to the left. Drivers should adjust their speed to safely continue on the road.